A DxOMark overall score of 60, (portrait) color depth at 21.7, dynamic range at 10.8, and low-light ISO at 644: clearly we are no longer in the typical world of compact cameras and their small sensors. The PowerShot G1X is achieving scores close to those for Canon’s entry-level reflex line (see the results of the Canon EOS 1100D, for example). In concrete terms, what does all this mean? A DxOMark score of nearly 20 points more than its closest competitor. 2 more bit of color depth. And most notably, nearly 2 stops better for low-light ISO. These results aren’t really such a surprise: the PowerShot G1X’s much larger format allows the sensor to capture much more light, which means a proportionate diminishing of noise. Given these results, we cannot help but congratulate the manufacturer for putting this kind of sensor into a compact camera. Up until now, the entire compact category relied on the same sensors as the lowest-level compact cameras, which meant that their usefulness was restricted. The Canon compact: a superb success! Let’s take a look at the evolution of the GX PowerShot line. No debate here – Canon changed the sensor and the results are spectacular! Following excellent remarks on the DxOMark forum, we updated our Canon G1X review with this comparison. On one side, the Fuji X100 was a real curiosity when it was launched last year. But it seduced a lot of savvy photographers – and the DxOMark team (see our X100 review). With its 1000 $ price tag and its fixed 23mm f/2.0 lens, the Fujifilm X100 was designed to please only the advanced photographers. On the other side, the Canon Powershot G1X approaches the needs of enthusiast photographers with more versatility than the X100. To conclude, the Fuji X100 is unbeatable in terms of pure image quality, but its fixed non-interchangeable lens confines it to a particular type of photography. The G1 X is not ridiculous though, and thanks to its zoom lens covering a useful focal range, it is still a highly versatile camera that can deliver excellent results in most situations. In terms of sensor quality, the images produced are very similar: if you shoot at low ISO, you will likely prefer the PowerShot G1X, even though the Panasonic has a slight lead in low-light scores. In terms of compactness, the Panasonic and the G1X go head-to-head, given that the Canon has a very compact lens and that Panasonic offers very small interchangeable lenses (notably the LUMIX G X VARIO PZ 14-42mm). In terms of flexibility, both the Olympus and the Panasonic come out ahead of the G1X: the ability to change lenses is, after all, a fairly big plus. The lenses for these two brands largely overcome many of the problems affecting their sensor scores. At low ISO, the Nikon 1’s good results (comparable to the G1X’s) prevents a complete blowout. By contrast, the G1X is clearly the winner by 1 full stop in low-light. This is where the sensor format truly makes a difference – the Canon’s low-light score has a big impact on its overall DxOMark score. On the one hand, the Canon sensor will let you shoot under low-light conditions, but its fixed lens has a maximum aperture of f/2.8. On the other hand, while the Nikon sensor is less sensitive, its cameras allow you to use such compact lenses as the Nikon 1 NIKKOR 10mm f/2.8 (with the possibility of even brighter lenses in the future). Note: Our protocol doesn’t make it possible to accurately measure the lens transmission on non-interchangeable lenses. So we won’t be publishing this measure for the Canon G1 X. With a DxOMark score of 15, the performance of the Canon PowerShot G1 X lens is comparable to that of kits lenses for APS-C and even for full-frame cameras. – Absence of vignetting across 2/3 of the field, regardless of focale length and aperture. – Chromatic aberrations are absent or negligeable between focal lengths from 21mm to 44mm. – Poor sharpness along the edges starting at the 21mm focal length. Left: JPEG (corrected) image at 15mm f/4. Right: CR2 image at 15mm f/4. When shooting, the preview screen displays only the corrected (JPEG) version. Keep this in mind when shooting in RAW: what you see is not what you’re going to get without processing. This comparison is interesting because the two sensors have an identical pixel pitch of 4.16µm. In fact, thanks to its slightly larger sensor, the 7D performs better in low light. But the curves for SNR 18%, dynamic range, and color sensitivity in screen mode show that both sensors have pixels of equivalent quality. Now that we’ve covered the basics, let’s compare the G1 X lens with other lenses mounted on the Canon EOS 7D. With a DxOMark score of 15 points, the G1 X is much better than many other kit lenses (such as the Canon EF-S 18-55mm f/3.5-5.6 IS II). Vignetting is absent on most of the field, with less dark edges. Less affected by chromatic aberrations. When retracted, the lens is ultra-compact. 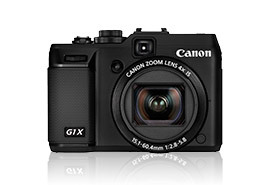 With the PowerShot G1 X, Canon proposes a quality alternative to such entry-level SLRs as the Canon EOS 1100D, for example. Very good handling of chromatic aberrations. The Canon G1 X lens performs better overall than these other micro 4/3 lenses. The G1 X’s only drawback is that its resolution is better only for its first two focal lengths and when under f/5.6. The Canon PowerShot G1 X is a powerful lens. This high-end compact can readily replace an APS-C camera and kit lens, and it has better overall optical quality than many hybrid camera kit lenses. Overall the G1X is definitely an excellent point and shoot cameras. But, now for the bad news in this review: The G1X’s sensor itself shows no measurable improvement. As proof, we need to take a look at the results of the Canon EOS 7D vs Canon PowerShot G1X. Why this comparison? The G1X and the 7D sensors make use of the same size pixel (4.2 µm). The Canon EOS 7D is a bit dated, but the Canon APS-C cameras that came after it didn’t have any new sensor features (see the results for the Canon EOS 600D and 60D). As explained here, DxOMark scores are normalized for a 20 x 30 print at 300 dpi. The Canon EOS 7D’s sensor surface format is slightly superior and thus it logically ends up better placed in the low-light rankings. Here we are interested only in pixel quality, so let’s take a look at the curves for SNR 18%, dynamic range, and color sensitivity when we toggle to screen mode. The results are surprising: The G1X pixel provides identical results for SNR 18% and color sensitivity as the Canon EOS 7D, and only very slightly inferior results for dynamic range. So while you will enjoy the same kinds of good qualities for the G1X as for Canon’s APS-C cameras, you will also experience the same problems (see our review of the Canon 500D vs D5000 cameras): The dynamic range is still limited by significant noise at low ISO.